Hurricane Harvey caused catastrophic damage to the eastern coast of Texas, with the Houston area receiving record-breaking rainfall that resulted in widespread flooding. An estimated 30,000–40,000 homes in Harris County were destroyed. Here at Rooster Teeth, we’re eager to help our neighbors to the east. We hope this will be a good way to bring the entire RT community together to support those in need, many of whom are our own friends and family. We chose the Houston Food Bank because it is a local charity that works to provide relief not just during the disaster, but in the months after, when the media has moved on to other subjects but people in the area are still trying to get their lives back together. UPDATE: We've officially posted our $10,000 match to the Houston Food Bank. Thank you to everyone who tuned in for the charity stream and helped us hit this goal. 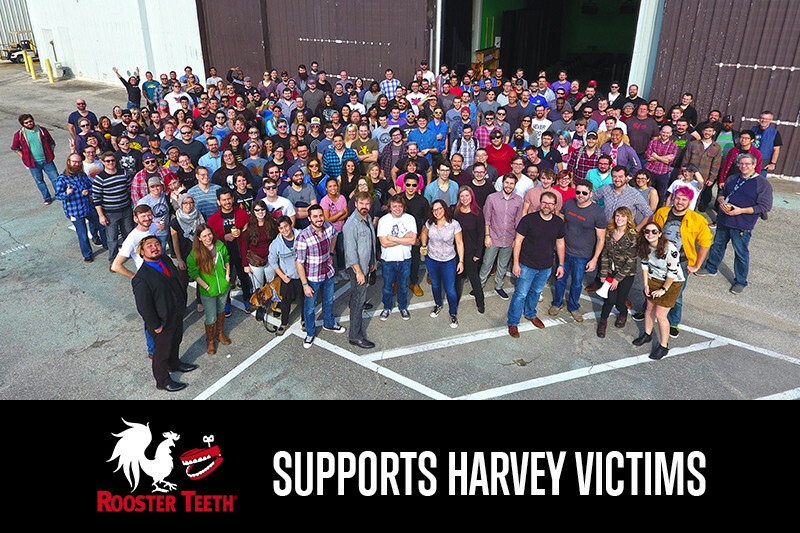 All of us here at Rooster Teeth could not be prouder of this amazing community who has helped us help friends and family located in the Houston area.